A guy's work can be a beat-down. Any given day, us guys may work long hours, deal with stressful situations, labor under high pressure, and by the end of the day we are ready to be done! The mentality all men are tempted to have is this: "I've worked hard today because my role in this family is to provide food, shelter, and money. I have done my part today so I deserve a break." Of course, us men know that our job as the head of our home is to serve, not be served. Above and beyond any other person in our family, God has called us men to expend ourselves daily in self-sacrifice for those we love and lead. Ok, you already knew that. The question is "How can I come home energized and ready to lead and serve my family? I'm tired!" On the drive home, I try to mentally and emotionally push my work responsibilities aside and focus my heart towards my family. That stuff I didn't finish, the deadlines, the work ideas that come pouring in - I can worry about that at 8:00am tomorrow. This is so hard to do, but I have to try. As I'm parking, I always say a quick prayer that sounds something like this: "Father, I'm done with my professional job, but I have four more hours of work to do at home. Give me strength to wrestle and play with the kids. Give me mental focus to have genuine conversations. Give me courage to initiate serving my family. Give me the power to act a little more like Jesus for the next few hours until bedtime. Amen." Lastly, as I approach my front door and reach for the doorknob, I remind myself of my "walk in the door" routine: First, I hug and kiss my wife, and ask how her day was. Secondly, I pick up my kids and give them a firm squeeze. Lastly, I start looking around for ways to demonstrate servant-leadership. Man, I want to crash on the couch right now! But does my wife need help finishing supper? Do my kids need to be played with? Do I need to help clean up the house? Do I need to handle a discipline problem? Does someone in my family appear to need some special attention right now? I hope that helps. Now go home, spiritually lead the family God has blessed you with, and wear yourself out serving those you love. 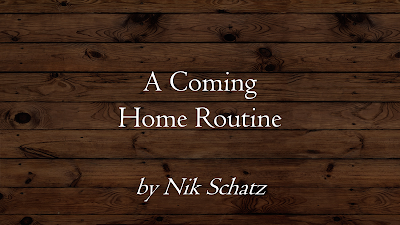 If you have other steps in your "coming home routine", leave those in the comments below.